Ergonomically designed forms provide naturally curved, relaxed fit to reduce hand fatigue. Ultra thin bare hand sensitivity with strong abrasion PU palm. Provides good wet and dry grip, silicone free. Best Seller in the Industrial Market. 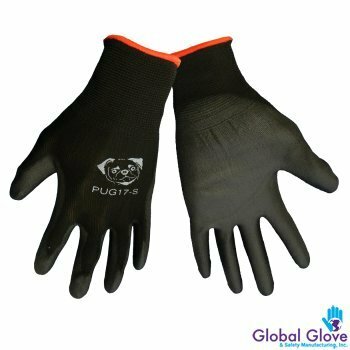 These gloves by Global feature a 13 gauge black nylon shell with a black polyurethane (PU) coating on the palm and fingertips. The Ultra lite nylon shell provides comfort. The combination of a thin nylon shell and PU coating provide excellent tactile dexterity and bare hand sensitivity. The smooth PU coating allows for superior dry grip. It is a silicone free ptoduct.